The movie that put zombie films on the map has been turned into an interactive YouTube game. George A. Romero directed Night of the Living Dead back in 1968, and the movie went on to inspire a mega-wave of zombie media that lasts to this day. Due to mishandled copyright issues, the film can now be used for homebrew projects without fear of legal repercussions. One of those recent projects is an adventure game that can be found on YouTube. Dubbed Editing the Dead, the game uses portions of Night of the Living Dead to create a Choose Your Own Adventure style tale. Using a YouTube feature that allows uploaders to link to other videos, Night of the Living Dead has effectively become an FMV game. You won't find the entire tale included in Editing the Dead, as it only features a couple of the main characters as they try to survive in a farmhouse surrounded by zombies. Players will be given choices between hiding in a car or leaving it, or helping a fellow survivor barricade the house versus taking a nap. If you die, you're taken back to the last choice you made. 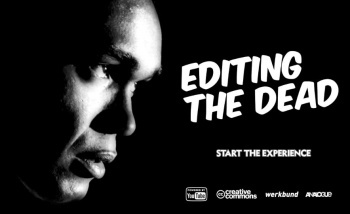 It's a very clever idea, but Editing the Dead is somewhat of a letdown at the same time. In my experience, the game becomes more of a movie that you click through once you get to a certain point by only giving players one choice in many situations. However, it's still a neat use for an old movie now in the public domain. There was another similar project created as an advertisement for a pizza chain that gives you more meaningful choices (found here), but it doesn't exude the nostalgia of Romero's classic. The group that put Editing the Dead together has asked for suggestions for more classic movies it could edit into adventure games, but they'd likely have to be in the public domain. Editing the Dead can be played here.